ESPN’s boxing broadcast from Philly on Saturday opened with the 24-3 Ray Robinson facing the 21-0 Egidijus Kavaliauskas in a scheduled 10 round welterweight affair. Lithuania’s Kavaliauskas stalked his man throughout the first two rounds. The next two rounds showcased more of the same, with Kavaliauskas landing with a degree of effect. The middle rounds saw Robinson picking up the pace a bit. The problem for Robinson was that his opponent hit harder and was able to cut off the ring with some success. The second half of the fight was engaged closer to the center of the ring than the first half. Still, both fighters were cautious, something that was noted (without pleasure) by ESPNs broadcast team. By the last round, Robinson was able to effectively flick his jab, and actually displayed a bit of aggressiveness. The fight was ruled a majority draw. Soon it was time for the main event. 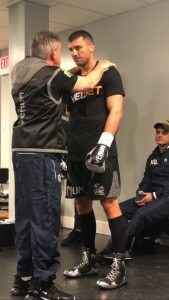 The last time the world had seen Oleksandr Gvozdyk, the 16-0 fighter had taken the crown from longstanding WBC light heavyweight champion Adonis Stevenson by beating the aging titlist into what would eventually become a coma. Still in the shadow of that tragic event, the Teddy Atlas protege slipped between the ropes to face the 38-8 Doudou Ngumbo. Gvozdyk appeared to be the significantly bigger man right from the opening bell. Gvozdyk patiently worked his way through the 1st, while the awkward Ngumbo found his moments. The 2nd round was interesting, with Gvozdyk trying to work the body. The 3d was fairly close, with Ngumbo throwing off the champion’s timing. Ngumbo began to showboat at the end of the 4th. One could be forgiven for feeling the man might have started to dominate, should he have thrown more punches. The fight was abruptly halted in the fifth, when Ngumbu seemed to hurt his leg with no help from the champion. Oddly enough, the fighter was given five minutes to recover…but the bout was officially stopped after a few minutes, regardless. Gvozdyk was given a TKO victory as the result of a very strange turn of events.